Note: This data reflects the children and youth whose concentration of the chemical met or surpassed the limit of detection. The 50th percentile concentration is the middle concentration, above and below which there is an equal number of values. The 95th percentile concentration is among the highest exposures. Source: CICH graphic created using data adapted from Statistics Canada, Canadian Health Measures Survey, 2007-2009 and 2009-2011 – custom runs. 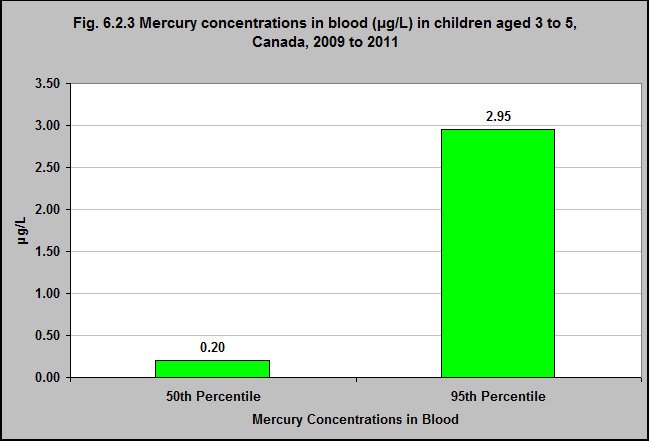 According to the Canadian Health Measures Survey, for children and youth aged 3 to 5 in Canada, the median (50th percentile) and 95th percentile blood mercury concentrations in 2009-2011 were 0.20 µg/L and 3.0 µg/L, respectively. However this age group had the highest concentration of all children up to 18. 2Legrand, M., Feeley, M., Tikhonov, C., Schoen, D., & Li-Muller, A. (2010). Methylmercury blood guidance values for Canada. Canadian Journal of Public Health, 101(1), 28-31. 1Environment and Climate Change Canada. Health Concerns. (last modified 2013). Mercury. https://www.ec.gc.ca/mercure-mercury/default.asp?lang=En&n=0EB35C98-1 – accessed March 12th, 2017.